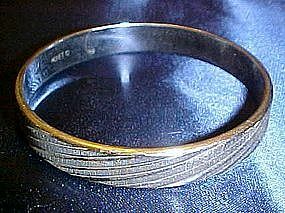 Nice silver bangle bracelet, marked Monet. Measures 3/8" wide and has a nice twist cutting on the entirity of the bracelet. This may be sterling, or maybe not. It is in excellent condition. GOld color on edges is just a reflection from the flash. It has no variation of coloring on the silver color.